Kitchissippi Q & A : Where do ice cream trucks go in the winter? Q: I work at Tunney’s Pasture and am a big fan of the Merry Dairy. I often pass by the truck on the way to work, and seeing it cruise down our street this summer has been a definite highlight for my family and I. I was wondering when her season ends and what she’s going to be doing over the winter. Thanks for your question! First of all I must point out that the Merry Dairy – a.k.a. West Wellington’s Marlene Haley – doesn’t technically serve ice cream, it’s frozen custard; cream, sugar and eggs made into a velvety concoction that is always served fresh on the day it is made. I am sad to report that the Merry Dairy’s 2013 season is officially ending at the end of the month, but you will have one final opportunity to bid her adieu. The Merry Dairy is partnering with Fisher Park Community Centre and the Parkdale Food Centre to become The Scary Dairy for one evening of fun on Halloween night. The Scary Dairy will be playing spooky tunes and scooping up some goodness with the goal of scaring away hunger. If you bring a food item, you’ll get to enjoy an end-of-the season sample and receive a coupon for a free cone next year. That’s a pretty sweet deal. Over the winter the truck will go into hibernation and Marlene will be taking a trip to St. Louis, Missouri for an ice cream conference. (St. Louis is famous for its frozen custard don’t you know!) 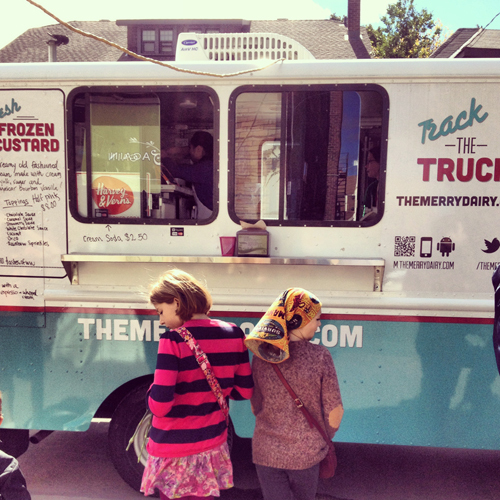 Her frozen custard truck will hit the road again when the weather improves some time in April. I recommend you stay in the loop via her website (www.themerrydairy.com) or Facebook page.